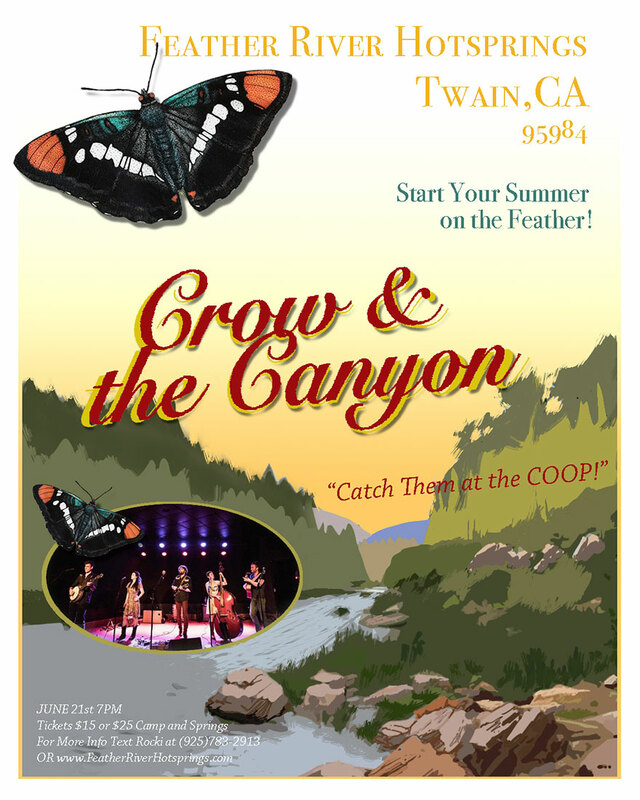 Please join us for a concert on the Chicken Coop Stage at Feather River Hot Springs. Concert at 7 pm. Catch them here at The Chicken Coop before they head up to the Kate Wolf Festival! Although the band has only been playing together since 2014, Crow and the Canyon sound like a band of age-old collaborators and friends. Their heartfelt yet cerebral lyrics, soaring vocals, and impressive instrumentals are endlessly listenable, while also remaining inventive and interesting. Their debut album, Leaving Soon, is a refreshingly contemplative take on high-spirited Americana songwriting which rewards repeated listening, and weaves back and forth between precise bluegrass, heartland acoustic folk, and bluesy country. The result is a series of songs that sound just as natural on a front porch in the heat of summer, in a dimly lit basement pub in the dead of winter or rollicking on a big festival stage. Their charismatic, engaging performances have garnered them a beloved reputation that keeps music lovers returning time and time again. Visit their website at crowandthecanyon.com.